It is so easy to make chocolate bark at home with only 2 ingredients! This easy recipe for chocolate bark produces a marbled bark that is so delicious and pretty! If you love chocolate as much as I do, you need to try out Chocolate Peanut Butter Rice Krispie Treats and Homemade Peanut Butter Cups. Sometimes simple desserts are best. Especially when it comes to chocolate. A piece of dark chocolate all on it’s own is usually enough to satisfy, but I also like to dress it up a bit and make a simple marbled chocolate bark. 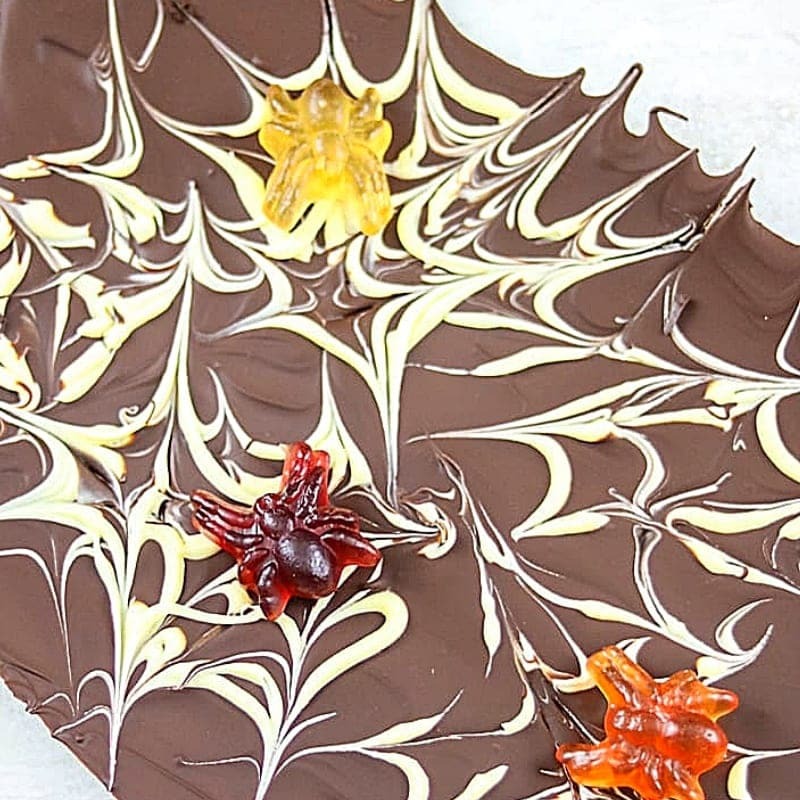 Marbled chocolate bark makes a delicious treat, is perfect to give as a gift, and is super fun to make during Halloween months–the marbled chocolate looks like spider’s web. 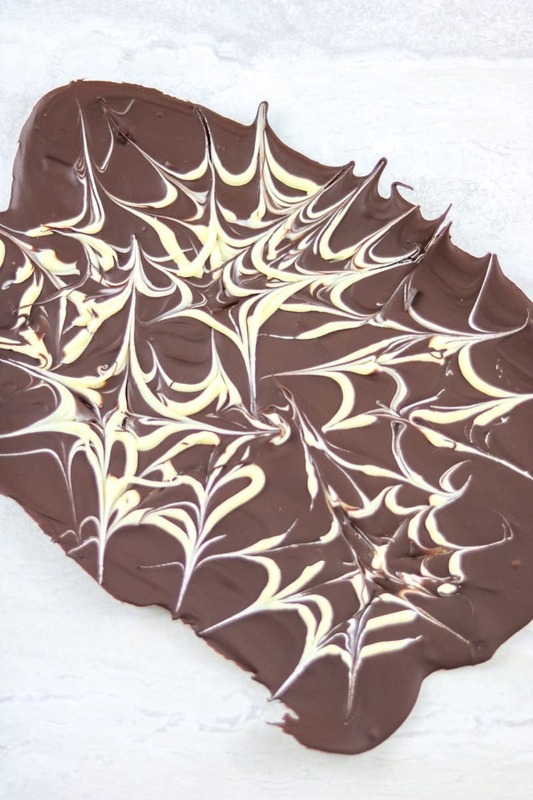 I also love to use this chocolate bark to dress up cupcakes or cakes. 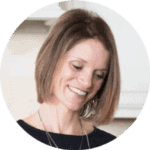 Fancy and impressive–yet so easy! This recipe for chocolate bark requires a few steps, but it is still SO easy. In fact, it is a great recipe for kids to help out with. Step One: Melt your Chocolate. 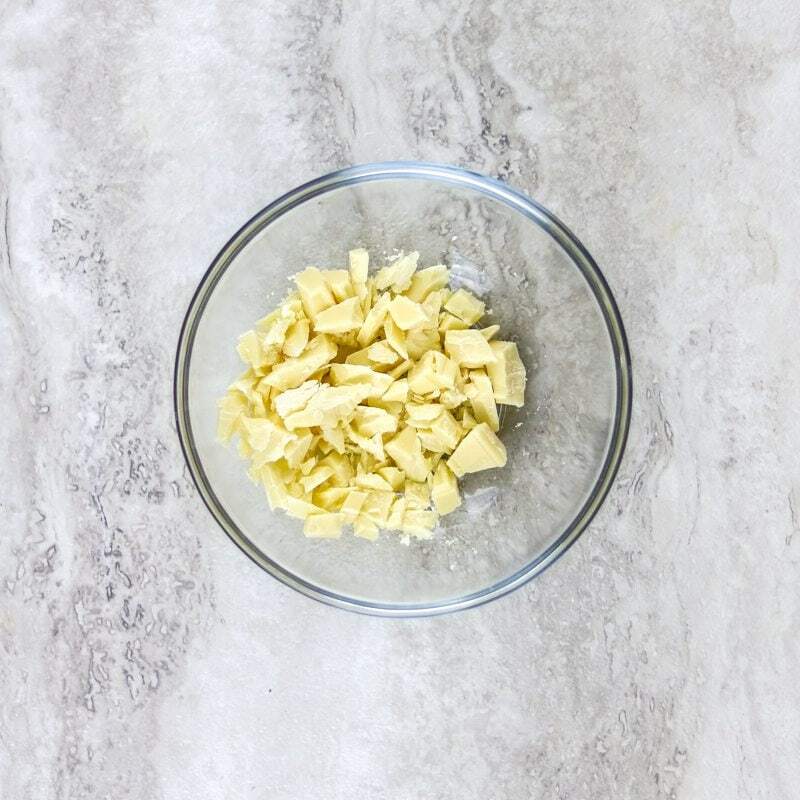 I place my white chocolate in a bowl and and my dark chocolate in a bowl and microwave each for 30 second intervals in the microwave, stirring after each interval until melted and smooth. This took me about 3 minutes for the dark chocolate and 2 minutes for the white chocolate–but it will be determined by your microwave’s power. 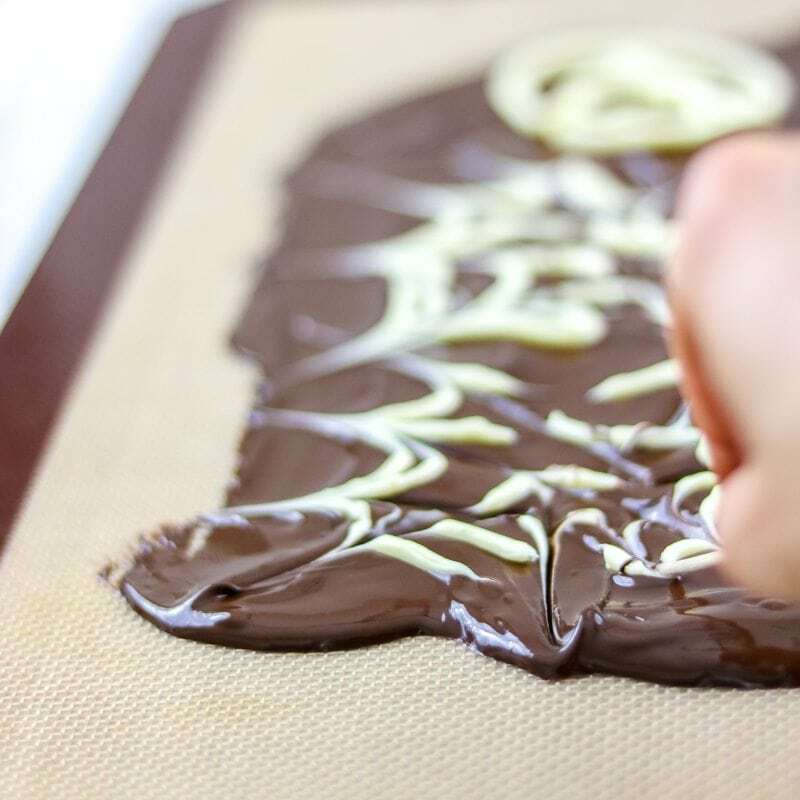 Pour your dark chocolate onto a non-stick silpat or wax paper and spread out to an even layer. 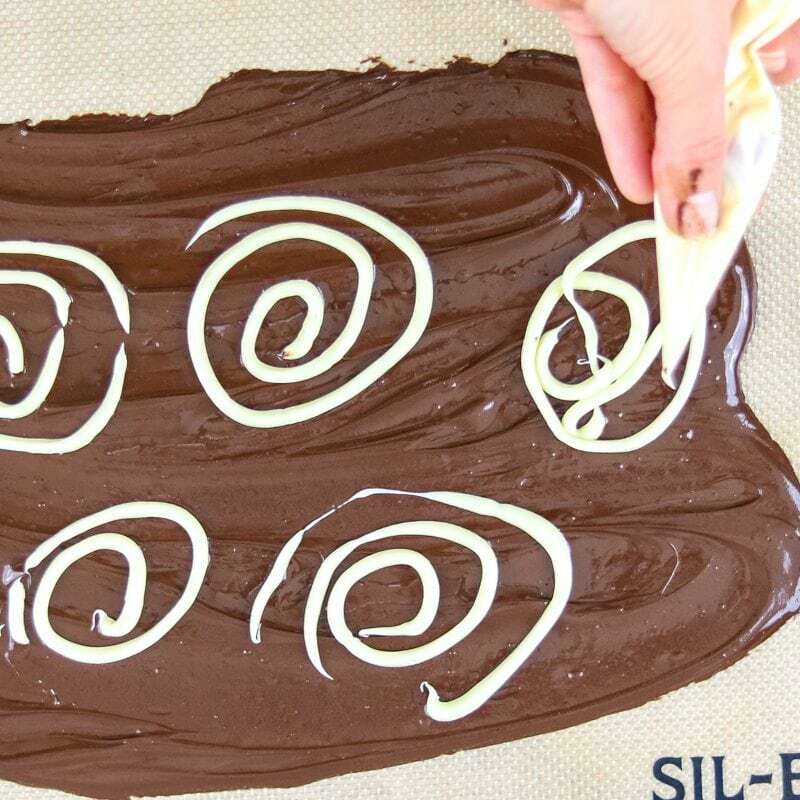 Put your white chocolate into a pastry bag or plastic sandwich bag with tip cut off on one side and pipe swirls randomly over dark chocolate. Using a toothpick, run lines through the white chocolate, creating a spider web effect. Allow your chocolate bark to harden at room temperature for about 30 minute or set up in the fridge for about 10 minutes. Break into chunks and serve or package. You can also melt your chocolate over a double boiler instead of in the microwave, just be sure to not get any water in your chocolate to prevent it from seizing up. 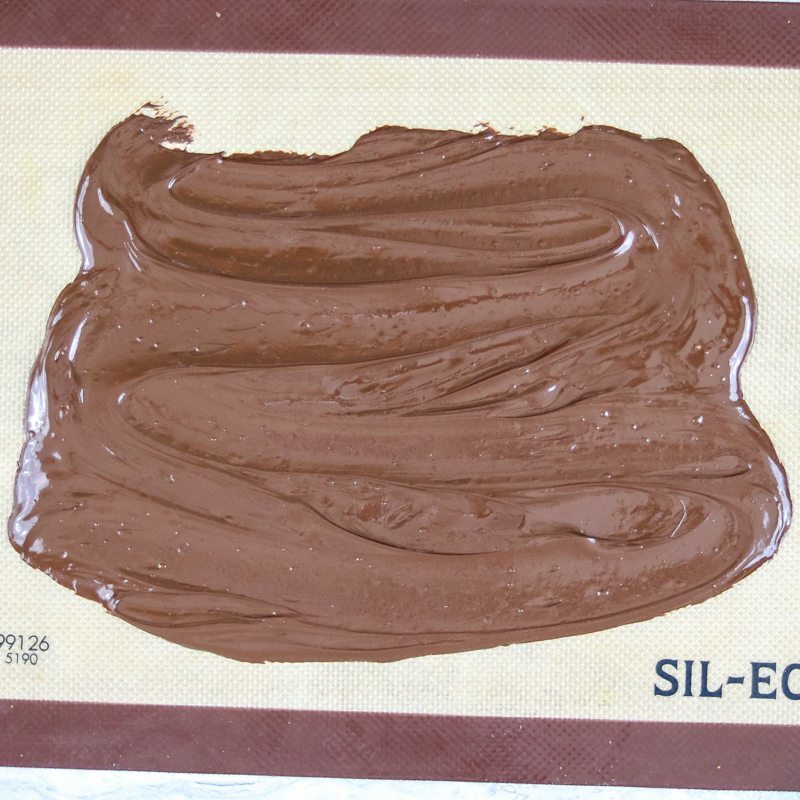 Have your silpat or piece of wax paper next to microwave or stove so you can put your spoon on it in-between stirring chocolate to keep your counters clean. Place your pastry bag or sandwich bag in a tall glass and drape sides over the rim of the cup so that it is easy to scoop the melted white chocolate into the bag. If you don’t have toothpicks to drag through chocolate, use the tip of a butter knife or a metal kebob skewer. Work quickly. Once your chocolate is melted, it is best to complete your bark in 5 minutes. 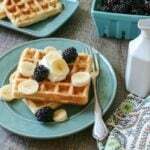 And this recipe is so easy, you can do just that! Place white chocolate and dark chocolate into 2 seperate glass bowls and microwave each at 30 second intervals, stirring between each interval until melted and smooth. Pour dark chocolate onto silpat or wax paper and spread to thin 1/8 inch with back of spoon or spatula. Place melted white chocolate into a pastry bag or sandwich bag with tip cut off, and piple swirls randomly over chocolate. Using toothpick or butter knife, drag through the white chocolate to create what looks like spider webs, or swirls. Allow chocolate to set up in fridge. Here is my Halloween Chocolate Bark–isn’t it cute? Love this idea for Halloween! I love how simple and effective it is, I’m sure the kids (and everyone else!!!) would love it! Love Chocolate Barks… They are ridiculously easy yet so gourmet. 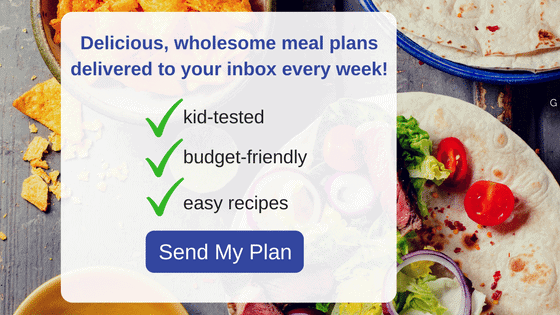 And who dosen’t love ridiculously easy recipes?! How cute! So perfect for Halloween and simple to put together. I love the pairing with the spiders. My kids would love this. The spiders make this SO fun for the kids! What a fun activity to do in the kitchen with the kids for Halloween. I bet I would have plenty of helpers for this recipe. This is so cute!! And I love that it’s allergy-friendly. So perfect for a happy Halloween! Thanks!! It is a perfect treat for everyone!